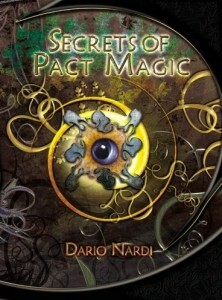 Radiance House Publishing released Secrets of Pact Magic and Villains of Pact Magic a couple of years ago as supplements for 3.5 Dungeons & Dragons. Dario Nardi, the man behind the books, recently updated the series with a free 4 page Pathfinder conversion guide. The guide makes the rules supplements more accessible for groups using Paizo’s successful iteration of D&D 3.5. Atomic Array and Radiance House were kind enough to provide me with review copies, which I promptly read but unfortunately didn’t have time to use at the table before writing this. However, I did like what I read and these books give GMs and players a very different approach to magic that is actually very easy to integrate into an existing campaign. Spellcasters can easily begin using pact magic by simply giving up spell slots. This makes the rules painless to introduce and test. The pact magic presented in the book is inspired by real-world rituals such as those found in The Lesser Key Solomon which is pretty interesting. This 330+ page tome has a beautiful cover which has an abstract style not often found in fantasy gaming supplements. The interior uses black and white illustrations, some of which remind me of brushed ink renders. Beyond the new pact magic and over 100 spirits to bind, Secrets of Pact Magic also introduces new races, base classes, prestige classes, spells, and magic items. What I didn’t expect, but which was very welcome, were the encounters that make for an excellent means to introduce pact magic as well as making pact magic a worthwhile addition to your game. The flavor and story of each spirit was obviously very important when it came to writing this book, and I’m glad. Every spirit has its own geometric sigil, a well developed legend, and an associated constellation (which is a keyword that many new feats, racial traits, and class features make use of). I am especially fond of the summoning rules which not only include a binding DC and character/environmental requirements but also the description of how the binding ritual is performed and what the manifestation appears like. Another good design feature is that no matter what you roll on your bind check, you receive the granted abilities of the spirit. However, if you fail the check, you are unable to suppress the physical signs and your alignment and personality may shift to take on the traits of the spirit. On the other hand, if you succeed on the check by 10 or more, you get a capstone ability, which a bonus granted ability. Each spirit also confers a tactical bonus to any d2o rolls when any of its listed criteria are met. Spirits may also grant favored allies (I wonder why we haven’t seen more of this mechanic in D&D), favored enemies, and even inspired companions. The final chapter of the book also gives readers the tools to create new spirits and pactmakers which I think is an importance feature that allows GMs or players to tailor spirits for their particular setting or character. 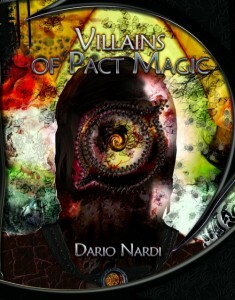 Villains of Pact Magic is a 210+ page supplement to the original Secrets of Pact Magic and introduces four more classes as well as new spirits, feats, flaws, and spells. It then gives GMs new challenges to throw at their PCs in the form of detailed organizations replete with lore, adventure hooks, new monsters, locations, and encounters. Besides the organizations, Villains also has an interesting chapter called Binder Challenges. This chapter contains traps, terrain, puzzles, and rules for stage plays (where the binders must participate in a play that reenacts a spirit’s life. It also includes maps and descriptions of four adventuring sites. This 4 page document really only has 2 pages of changes that brings both Secrets of Pact Magic and Villains of Pact Magic up to date with the new Pathfinder RPG rules. Most of the changes include hit die and ability score adjustment. The transition appears to be pretty smooth. Radiance House has a free section on their website that allows you to download excerpts of the books to whet your appetite as well as the Pathfinder Conversion Guide and quite a few web enhancements (including base & prestige classes, feats, and monsters) to use in your game. Drop by Radiance House Publishing today!